I can remember my Air Force ROTC class on communications skills where we had to put together a “talking paper” and give a presentation to the class. We were advised to practice with our peers before the class. Several folks did so, and still did poorly when it came time to give their presentations. Why? It’s because although they practiced, they didn’t practice “perfectly.” Let’s look into what that’s like. If you’re learning to present, you need to know what you’re doing right and what you’re doing wrong. The knowing wrong part is especially important because a lot of times we don’t realize we have a bad habit or issue and it takes someone pointing this out. When we start working with a new speaker in Toastmaster, the mentor should be available to help that person prepare for their icebreaker speech. Part of this is to give feedback before the actual presentation. Truth be told, some folks need several attempts to practice before they are ready even for that initial speech. After the initial speech, and after every speech for that matter, in Toastmasters there’s an evaluator assigned. The evaluator talks about the good and the bad. Even great speeches have something about them which the speaker can improve upon. As a result, in good Toastmasters clubs, you’ll hear evaluators say things like, “It’s a great speech for all the reasons I’ve already given. If there is one thing you might be able to improve upon…” Obviously, if a talk needs a lot more than that, the evaluator may remark on a few things, but usually focuses down to one thing to work on for the next speech. When giving this feedback, the evaluator is supposed to be honest, but kind. The criticism is supposed to be constructive and encouraging. If you’re preparing for a presentation, you want the same kind of feedback. Gather folks who will be honest with you, but in a constructive way. If it takes a few attempts to polish your talk, that’s okay. Listen to the feedback, think about how you might incorporate it, and try again. Each attempt to improve moves you towards that perfect practice. If you’re giving a talk, practice with the conditions that you expect where you’re giving a talk. Have the lights dimmed. Have the projector going. Make sure someone’s running a clock to keep track of how long or how short your practice session goes. If you make a mistake or have a glitch with the demo, don’t stop unless it’s catastrophic. Instead, recover and continue. After all, such an issue might happen during your actual talk. Plan to have time for questions. Your “test viewers” should expect to give you a few. If you want to give a solid presentation, you have to practice your talk. I had a lot of experience talking and presenting. I was a drug/alcohol prevention specialist in college, I gave briefings to colonels and senior federal civilians my whole time in the Air Force, and I had taught Sunday school and led children’s ministry programs for years before I ever gave my first technical presentation at SQL Saturday Jacksonville. However, that first session I ran out of time. I was rushing the last part of my talk and there was no time for questions. Even though I was a practiced speaker, I wasn’t a practiced technical presenter. I learned from that experience and became a better presenter. However, I still attempt to practice, at least solo, before I give any talk. You’ll find the best speakers often practice a lot. That’s part of what makes them the best speakers. Don’t neglect practice! Aunt Kathi. Grant Fritchey. Steve Jones. They’re part of five hours of training on SQL Server performance and DevOps with the database in mind. And it’s free. And it’s on-line. I’m looking forward to this. If you’re not familiar with what I’m talking about, it’s Red Gate’s SQL in the City. When SQL in the City was first envisioned, Red Gate put on sessions at various physical locations. There’s a problem with that: a lot of folks couldn’t make the travel. So now it’s virtual. As a bonus, they’re throwing in Grant’s new eBook on execution plans when it’s released. Again, free. Anyone who has been working with SQL Server for any length of time should be aware of the name Kalen Delaney. She is one of the luminaries in our community. Therefore, the opportunity to learn from her is definitely one you should seize upon. The first webinar is elementary, about SQL Server metadata, but it ramps up. For instance, the last couple have been on physical storage. Definitely something for everyone. This is put on by the MSSQLTips folks and we hope you’ll find it informative. If there’s anything specific you’d like me to cover, please comment on this post and I will see if I can work it in. While we might wish SQL injection was no longer a problem in our industry, multiple large breaches in 2017 alone reveals that it still is a problem. The largest among them was the Equifax breach, for which security researchers found a number of vulnerabilities in public facing web sites, which included sites vulnerable to SQL injection attacks. In this webinar we’ll look at how a SQL injection attack works, what an attacker can gain using a SQL injection attack, and how we might prevent such an attack. We’ll also look beyond Microsoft SQL Server, since the best layer for an attack is any layer that processes the input. 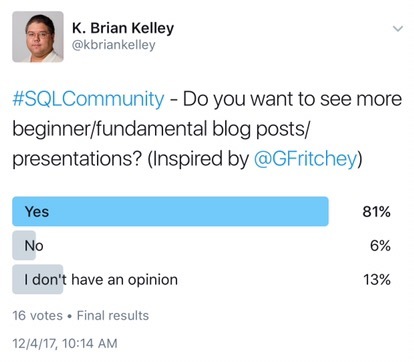 Not surprisingly, there are folks who want beginner / fundamentals presentations and blog posts. I put up the poll based on a brief conversation on Twitter about some folks wanting more advanced content and complaining when beginner content was offered. I’ve heard the same comments when I ran a beginner track at two SQL Saturdays years ago. I also know that some organizers have asked speakers to speak on advanced topics and discourage submitting basic ones. However, based on this informal poll as well as the current results on one running at SQL Server Central, we’d best serve the community to make sure there’s plenty of the lower level content available. I realize that there’s a low number of votes currently for both polls, but what they do show is there is a need for this type of content. The reason I put the poll up was to get more support for what I’ve seen empirically: the beginner track sessions are almost always near full. Others have commented on similar observations. Therefore, if you’re a blogger, consider posting more basic content. Organizers, don’t chase away fundamentals presentations, especially from established and accomplished speakers. MSSQLTips has opened voting for the 2017 author and rookie of the year. I’m included as a candidate for author of the year so if my articles have helped you the most, please cast your vote for me. If not, choose the author whose articles have.